I have finished my Santas. It feels good to have it done. This is the first time that I have couched anything. I like the result, but am not sure that I like doing it. The whole piece feels more fragile than usual because it has this cord just sitting on top of it. Do you still have this pattern for the santas? I had one of these magazines years ago and got rid of them after I was married. 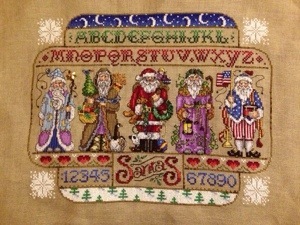 I took up cross stitching again after I divorced and came across this pattern in a search for santa pattterns for my mom for Christmas. I can’t find the pattern anywhere and I don’t need the whole magazine. Would you be willing to scan and email it to me? Thank you!! Sorry, that would be a copyright violation. However, I understand that this pattern is available in the 2017 Cross Stitch Keepsake Calendar.